Welcome! Thanks for taking the time to look through my project with Boyce College! 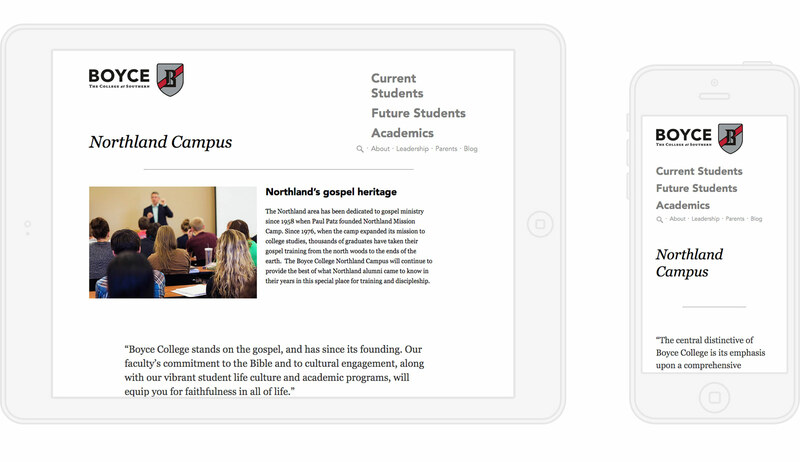 Boyce was launching the new campus called "Boyce Northland" and they needed a easy way to add the page to their Wordpress site as well as an intuitive way to manage edits in the future. It's always great to work with clients that are close to home for me, and Boyce College is right in my own neighborhood! Boyce College uses Wordpress to manage their website, so I new I had to make a great template that would grow with the college and allow them to make changes and updates in the future easily. Since Wordpress is so widely supported in the development community there are a lot of ways to make simple templates for Wordpress themes. I decided to use a widely supported premium plugin called Advanced Custom Fields. This allowed me to make a template inside Wordpress where Boyce could add modules, edit content, reorder the content and publish it all inside Wordpress. 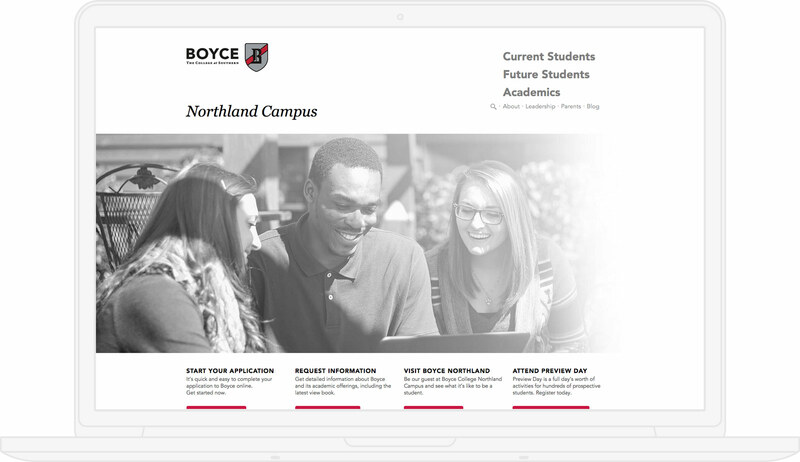 I really enjoy going above and beyond for my clients, and I built this template from the ground up for Boyce even though they just wanted a simple landing page for the new Northland Campus page. So now they can use the new template I made anywhere on the Boyce website. So it was a great investment for them, and was a pleasure to make something useful for them! Do you want a successful website for your College like Boyce?